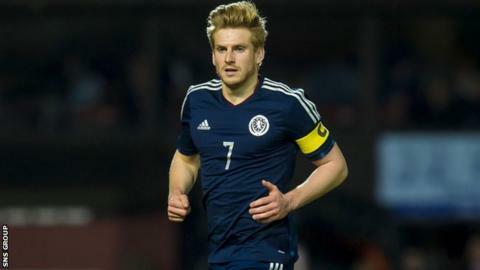 Dundee United's Stuart Armstrong is in line to win his 20th cap at U21 level when Scotland host the Netherlands at St Mirren Park on 28 May. Billy Stark's side are currently fourth in Euro 2015 qualifying Group 3. The Dutch are three points better off and have played a game less, with Slovakia at the top of the section. St Johnstone striker Stevie May, who has scored once in five appearances at this level, is also included in Stark's squad. May, with 27 goals for Saints this season, had been tipped for a call up to the senior side who play a friendly with Nigeria on the same day. However, Stark has been able to retain May and his captain Armstrong for a must-win match in Paisley, although Dundee United left-back Andrew Robertson, 20, has been picked by Scotland boss Gordon Strachan. Celtic and Hearts each have four players involved, while Reading goalkeeper Jonathan Henly is the only uncapped member of the group.